‘Frank’, was born at Lancaster on 12 January 1889, the second of at least six children born to Edmund and his wife Ellen. 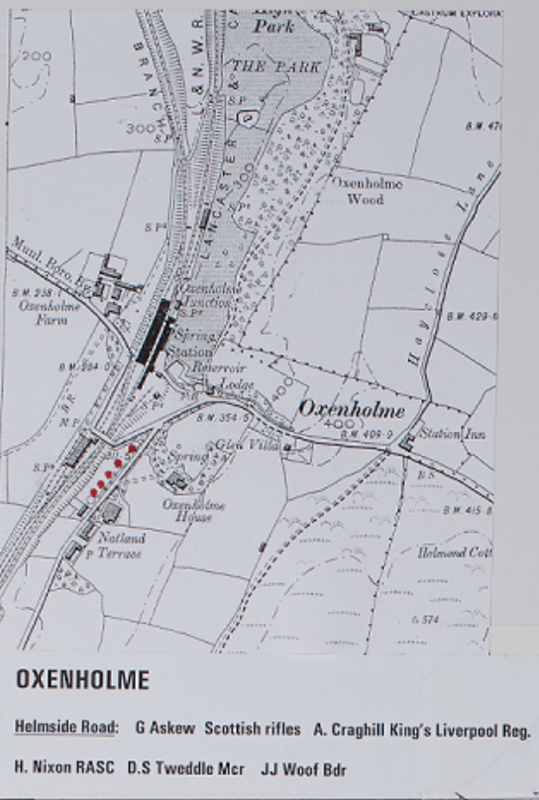 The family moved to 12 Helmside, Oxenholme when Frank was just 2, with Edmund being employed on the railway first as a yardsman and then as a shunter. Frank enlisted at Glasgow and served as a Private in the 8th Battalion of the Cameronians (Scottish Rifles). He died at Gallipoli on 8 June 1915. His name is recorded on the Helles Memorial, Turkey but not on the Natland memorial. Alexander, born in 1899, lived at 19 Helmside, Oxenholme and was the second of two sons born to William Cragghill and his second wife Catherine Cragghill (formerly White). Alexander’s father William, a railway engine driver, had thirteen children by his first wife Ellen Craghill neé Butler. Alexander served as a Private with the 13th Battalion, The King’s (Liverpool) Regiment. He died on 28 March 1918 during the First Battle of Arras. Alexander’s name is recorded on the Arras Memorial, France and on the original plaque of the Natland memorial. Herbert, born at Clifton, Westmorland in 1892, was the second of five children born to Thomas George Nixon and his wife Elizabeth Todd Nixon who lived at 24 Helmside, Oxenholme. Like his father, Herbert worked on the railway. Herbert married Helen Escolme in July 1917 and daughter Marian was born in October 1918. Sadly Helen died just three weeks later. Herbert initially served as a Private in the RASC Motor Transport Unit. He died from typhus on 25 January 1920 while serving in Southern Russia. Daughter Marian was brought up by her mother’s sister. Herbert’s name is recorded on the Haidar Pasha Memorial, Turkey and on a supplementary plaque added to the Natland memorial in 2008. Douglas, born at Oxenholme in 1891, was the fourth of eleven children born to James Swan Tweddle and his wife Rhoda Nixon who lived at 23 Helmside, Oxenholme. Like his father, Douglas worked on the railway. Douglas married Florence Cole at St. Peter’s Church, Aintree in 1916. He served as a Private in the 22nd Battalion, The Manchester Regiment. He died on 27 May 1917. His name is commemorated on the Achiet-le-Grand Communal Cemetery Memorial and at St. Peter’s Church, Aintree, but not on the Natland memorial. John, a farm labourer born at Oxenholme, was the second of eight children born to Joseph Woof and his wife Hannah Woof. He served as a Private in the 1st Battalion, The Border Regiment. He died on 23 April 1917 and is commemorated on the Arras Memorial. In November 2018, Kendal Library, with the support of Kendal Town Council and the Royal British Legion, created a walking trail to commemorate the sacrifice of the 316 men from Kendal and Oxenholme during the First World War. The above is an extract. Unfortunately, the red markers were placed at the wrong end of Helmside Road – all the men lived in Helmside Cottages off the map in the bottom left corner.